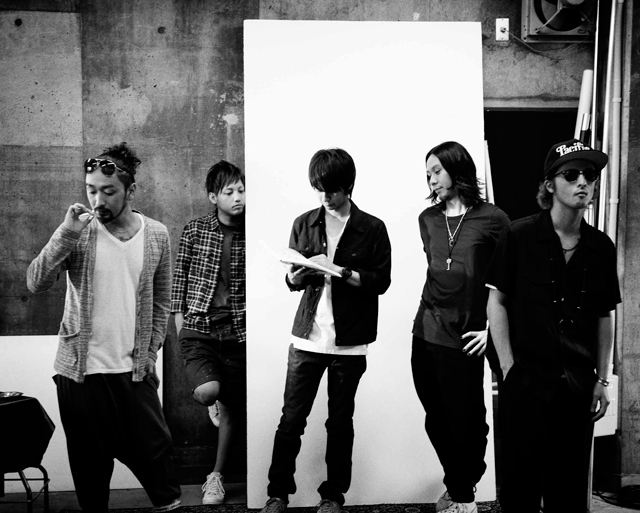 One of the top J-rock bands of the mid-2000s, Orange Range achieved fame and multiple animé credits invitations due to their ability to carefully interlace heavy riffs and commercial hip-hop elements in their predominantly pop/rock songs. They hail from Okinawa, the point of contact between Japanese and American culture thanks to the abundance of soldiers serving on the local U.S. military base, which has a profound effect on the local music scene; Orange Range is definitely proof of that even though the group formed in 2001 simply as a J-rock cover band. The group, made of high school buddies, soon moved on to original material, played local clubs and school events for a while, and secured a deal with an indie label. Their commercial debut single Michishirube only reached number 250 on the Oricon charts in 2002, but they still progressed, getting signed to a Sony Music sub-label, and scoring number 50 and then number five with their two subsequent singles. The band’s transfer to top league status was completed with the inclusion of their song “Viva Rock” into the credits of the popular animé series Naruto in 2003. Orange Range’s debut album, 1st Contact, was delivered that same year, stopping just one place short of the top of the Oricon, and although it fell off the charts very fast, this was still a success — and a sign of things to come, as after that the band embarked on a near-fantastic commercial rampage, scoring eight consequent number one singles. This was a record for the 2000s, and even the accusations of plagiarism against Locolotion did not stop Orange Range’s advancement, which culminated in the second LP, musiQ, selling 2.6 million units in 2004, and in their songs getting picked for another big animé, Bleach, as well as numerous TV commercials. The third album, Natural, sold 1.9 million copies in 2005, but Orange Range’s winning streak ended the next year, when drummer Kitao Kazuhito, one of the founding members, left the band. Initially it was said to be due to health problems, but eventually the truth got out that it was creative differences — more precisely, Kazuhito’s aversion to the band’s drift from rock to hip-hop. The group still managed to have their track “Champione” accepted as the official song of the 2006 Soccer World Cup, and then went on to have a 100,000-copy of their “limited” single Un Rock Star released; however, their fourth, self-titled album became their lowest-selling (only 347,000 units). Still, in 2007 they were back to form, writing songs for a J-drama, animé series Code Geass, and releasing a best-of double-CD that topped the charts just as their fifth studio album, Panic Fancy, did in 2008.